Records exist in history of cheese making in the early civilizations of Mesopotamia, Greece and Rome. Wine’s history is equally long. The pairing of wine and cheese seems to be a natural. National Wine and Cheese Day seems to be a good day to experience the flavors. Many experts write about what cheese pairs best with a particular wine, but as with wines I recommend you choose what tastes the best to you. However, there are some trusted guidelines. Throughout history, wine lovers in regions chose local cheeses to enjoy together. After all, that was what available. It still holds true that a good Montepulciano goes well with an aged Italian hard cheese. Also, an intense wine needs to be matched with an intensely flavored wine; while a sweet wine will taste best with a mild blue cheese or a Roquefort. Some of my personal favorites, a full-bodied Cabernet Sauvignon with an extra sharp cheddar, a lighter Sauvignon Blanc with a Monterrey Jack, or a Bordeaux style red blend with a creamy Swiss cheese. Whatever your tastes, hope you enjoy yourself today on this National Wine and Cheese Day! Summer is a great time for events at your local winery, usually including food, music, and lots of wine. This past weekend, Brianza Gardens and Winery hosted such an event. Along with Tony’s spaghetti and meatball dinner and his wonderful wines, visitors were treated to the music of Holly Spears. 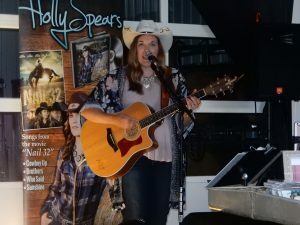 Holly Spears is a local singer, musician, and songwriter. She has recorded several CDs of a mix of music, including country, pop, and Christian. We’ve had the opportunity of hearing her before and have enjoyed listening to her. Check your favorite winery’s website for upcoming events. Music at a winery is a great way to spend a warm, summer evening! Wine lovers often go into liquor stores, both large party style stores and small neighborhood shops and wish for a better wine selection. In some, wine even seems like an after thought. Wine shops are popping up, but are generally small and the choices are limited. Kentucky wine lovers have now joined a group of wine connoisseurs in other states and have a new place to go. Both Lexington and Louisville are home to a Total Wine & More, a liquor superstore chain that focus on fine wine. The company originated in Delaware in 1991, as a small independent store and according to their website, has grown into the country’s largest independent retailer of wine, with each superstore featuring more than 8,000 wines (along with over 2,500 beers and 3,000 spirits). Total Wine & More can be found in over 20 states, and more outlets are opening. Conveniently located, off Nicholasville Road, in Lexington Green, Lexington’s new Total Wine & More opened in the spring. We visited first in May on a day that unfortunately experienced a power outage. In an effort to console the many customers that were turned away, the management met visitors at the door with a gift of stemless wine glasses. We went again this month and were glad we went back. For a wine lover, the selections are exceptional. 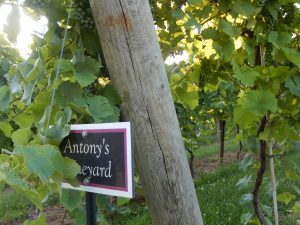 Kentucky wines, regional wines, domestic and foreign wines of just about every varietal. If that isn’t enough, the prices are better than most places we’ve shopped. We just discovered Total Wine & More, with the opening in Lexington. But other wine lovers in Kentucky have known about it for a while now. Louisville has had a Total Wine & More in the Paddock Shops, on the corner of Brownsboro Road and N. Hurstbourne Parkway since 2016. Some sources in Louisville are saying that a second store is coming soon. I recommend a visit to one of these superstores; it’s worth a drive. Or maybe a stop while vacationing to one of their other more than 175 superstores. Check out Total Wine & More online to find out more about it.